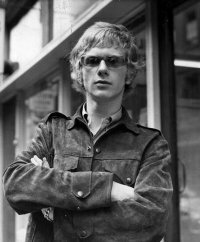 When the Rolling Stones first started out they had a manager called Andrew Loog Oldham. He was younger, cooler and better looking than they were. His previous job had been as a publicist with the Beatles, and he knew the Stones had no hope of competing with them. The Stones didn’t write their own songs, and he knew that what the Beatles had would see off any number of groups who tried to copy them. He knew the Beatles were not a flash in the pan. That there was no Next Big Thing around the corner. The Beatles were forever’s Next Big Thing. Loog Oldham knew he couldn’t compete with that, and he didn’t try to. Instead he worked out that what the Stones had going for them was that they weren’t the Beatles. They could be everything the Beatles couldn’t be, now they were trapped in a world of Royal Variety shows and light entertainment politeness. So that’s what he made them into. The scruffier, nastier, sexier alternative to the Beatles. The headline, ‘Would you let you let your daughter marry a Rolling Stone?’, was his. Every parent loved the Beatles. Now no parent would ever love the Stones. Now that’s what I call distinctiveness. Loog Oldham was a genius because he took the very thing that appeared to be a weakness and turned it into a strength. This is a strategy we don’t think of enough. But it can work brilliantly. Instead of masking a failing, shine a spotlight on it and turn it into a virtue that can fuel creativity. Groups that emerged in the shadow of punk were forced to the margins by scared record companies. So they made a virtue of their outsider status and over the time the result was the independent scene of the 8os. Edvard Munch (the man who painted The Scream) damaged his one good eye in later life, so he had two eyes functioning at different sub-par strengths. Instead of giving up he would cover his eyes alternately to “understand the distortions” and reveal in his painting the entirely subjective nature of vision. Luxury brands are beyond the reach of most consumers, so they cultivate an aura of exclusivity to add subjective value. In advertising we have the same weakness/virtue weapon at our disposal, if we only choose to use it. Most of the time, understandably, we concentrate on exploiting our own strengths, or our competitors’ weaknesses. But exploiting your own weaknesses can create equally distinctive results for brands. 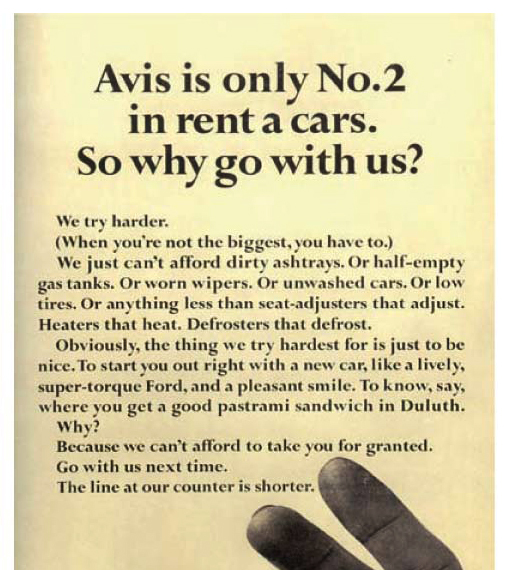 Avis made a virtue of being no.2 in the market to Hertz in the 60s with their “we try harder” campaign. But it doesn’t always have to be so explicit. A while back Orange struck a deal with iTunes to provide a free film download every week to all its customers. Some were worried that customers wouldn’t get to choose their film. In an era of abundance and consumer power this seemed like a failing. We felt the opposite. In a world of endless choice it can be great – and a source of relief – when someone’s made the effort to choose for you. Instead of admitting the weakness represented by the prescribed title, we wanted to use it to highlight the brand’s curator credentials. We wanted to turn an apparent weakness into a virtue. There are risks to this approach. Not everyone would like the film on offer. Just as not everyone who loved the Beatles became a Stones fan. But at least no-one could accuse the Stones of being a poor imitation of what they claimed to be. Instead they were simply brilliant at being what they were. And no-one can catch you out if you’re hiding in plain sight.